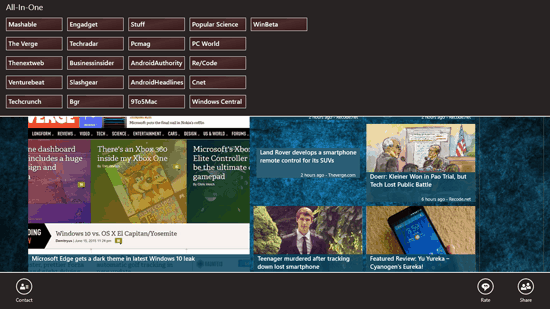 Tech News: All-In-One is a free news app developed for Windows 8 and 8.1 computer. The news app brings technology news from many media and news agencies such as PCMag, TechCrunch, TechRadar, The Verge, Mashable, Engadget, 9to5Mac, Windows Central and many more. The technology updates related to any brand, gadget, device, software, business and other things can be viewed on Tech News: All-In-One. It updates the news feed in seconds and minutes as the news is published on the corresponding publisher’s news website. The news are shown as a large tile on the screen with the image related to the news, the title of the news, snippet of the news article, time when the article was published and on which website is it published. The categories of the news on this news app are featured, latest, tech, mobile, social media, business, entertainment, world, reviews, gaming and trending. These categories have their own large sections of displaying the topic relevant news articles. The app scrolls like the default sideways parallax scrolling. The scrolling is same when you open a category to view the news in it. 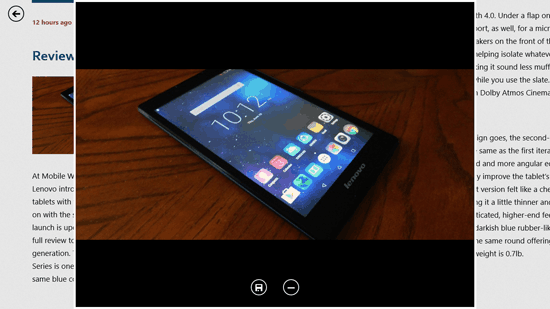 In the article when you click on any image, it will enlarge and will be displayed on the screen of the app. If you want to save the image, then you can click on the save icon on the bottom of the image and save it on your computer. You can change the font family and font size of the text in the app. You can also share the article with anyone you want to using the share button and emailing the article to the person. 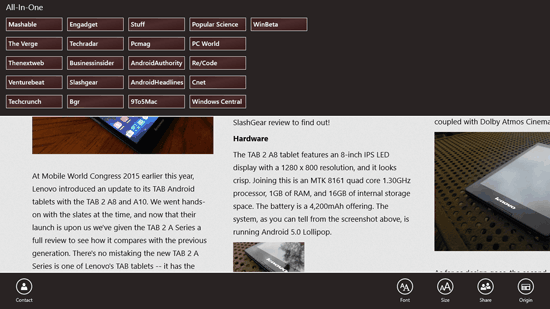 You can also check out news apps like the Huffington post and news 360 for Windows 8. Tech News: All-In-One is a really good app for the technology lovers and followers. You will always stay updated with the technological news that is going around on the web.